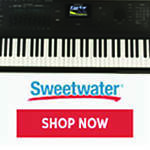 Register Log In Piano World Home Page Forums Digital Pianos - Electronic Pianos - Synths & Keyboards Buying a Used Digital Pianos? Hi so I was just wondering what the general consensus was on buying a used digital piano. The specific piano I had in mind was the yamaha p155, which seems to be the perfect piano for me, despite it not being sold anymore. Of course the newer model, the p255 would be a better option, I just don't have that kind of money to drop on a new DP like this. I found a used p155 in "excellent condition" (although 4 years old) with a pedal, bench, and stand on Ebay for 650, and this seems like a great deal, I'm just concerned about the fact that it is a four year old digital piano, and do not know what the risks are with buying a used piano. Any thoughts or opinions are very much welcomed. In 2015 I believe that for $650 you can do better with a new DP, with no loss of quality. The Casio PX-150 (and even better, I have been told, the PX-160) bundles at Kraft Music will set you back about the same amount as your used offer on eBay. And in my opinion the Casio is a much better-sounding and just as good-feeling instrument as the Yamaha. There are a number of other possibilities within your budget which I'm sure others will point out. It's probably fine. Yamaha is a good brand and they make quality instruments. I would be concerned though. What if it's defective? is there a warranty? can you return it? In that price range you can get a new Casio Px-160 (coming out at the end of the month) which comes with a full warranty and is a really excellent piano. And if budget is really a concern I bet you could get a great deal on the previous model, the PX-150 which is still an excellent piano (and while not the newest model anymore you would still be buying a new unit). Personally I'd go for the casio if I were in your situation just for the piece of mind (and that it is a very well regarded digital piano in its price range). But if you really prefer the sound or action of the yamaha, then it's *probably* an o.k. way to go. Two years ago, I bought a new PX-350 rather than a P155. It was a close call -- the P155 is a nice DP. Its GH action is is on par with the Casio. It doesn't get reported here as failure-prone. Neither the used P155 nor a new PX-150 would be a mistake, IMHO. A used P155 in good condition is a good buy. I like the action in the P120/P140/P155 series a lot, it is a solid, no frills piano. Soundwise it's not quite on par with more recent DPs of that price range (in particular, you hear a lot of static looping in long notes and chords), but IMHO the quality of the action is above most of the cheaper DPs sold today. I presume the condition is the seller's description? Not trustworthy. But even were you to examine the piano yourself, how can you judge "excellent condition"? The exterior might look excellent. And the functionality might be excellent. But the problems I've seen with my piano won't reveal themselves to such inspection. I've had minor issues with keys needing lubrication. And more costly problems with failing key sensor pads. These rubber pads fail with age and use. Knowing that, I wouldn't buy a used digital piano ... unless I had a way to know that it was VERY LITTLE used. Lacking that, I'd buy a new piano. Thanks for all of the feedback guys! It sounds like buying the used piano is more of a risk than its worth. A couple people have suggested the px150, but are there any more pianos that would be comparable to the p155? For me personally, action is the most important, as I would like it to mimic an acoustic (grand preferably) as much as possible. Really, for the sub-$1k market the Casio PX-160 is the way to go. Your money goes a lot farther. Once you're above that price point, however, then you are looking at some other models. However, it's always good to compare. You can try the Kawai ES-100, Roland F-20, which are slightly above your $650 price. Then you can go back to the Casio and see how it measures up. 20 years ago casio produced crappy keyboards that were little more than toys. It gave them kind of a bad reputation, but several years ago Casio really stepped up their game with the release of their privia line of digital pianos. They have a remarkably good action for the price point. If you can find a music store that sells them go play one, I think you'll be surprised at how good it is. If action is the most important feature to you (you can always use software pianos with you PC or Mac to get a better sound) then the Kawai is the only one that probably competes with the casio, and it is quite a bit more expensive (at least here in the states). Yamaha GH key action in P155 is a very solid action, the only thing comparable to it below $1000 is Kawai ES100. Also as mentioned Yamaha makes quality instruments, I saw Yamaha keyboards from the 80's that still work fine. So for a tight budget, P155 is a very good option if keybed is the most important thing for you. I decided against it because I knew that everything available on the used market were previous (or previous of previous) models of something. Most of the current models are vast improvements (for the most part) and are worth saving up for. For example, I couldn't justify getting a Casio Privia PX-135 over a PX-150 because I know there have been a fair bit of improvements. Now, with the current PX-160 out, it's different because it's a fair bit more money. I looked at the PX-150 too, then was going to wait for the PX-160 but that went so far up the price ladder that I ended up getting a PX-5S which I absolutely love. Having said that, if you needed something to knock around, I would consider used. Thank you everyone for your advice! I think I am going to steer away from buying a used piano now just because of the small risk involved with buying a used instrument. I do have a couple more questions though about the casio px150/160. First, how well does the key action mimic a grand piano? I have been playing the piano for quite a while now and have always practiced on a yamaha grand piano, however, now that I am in college I am in need of a digital piano that can at least decently mimic that kind of action. Second, what exactly is the difference between the casio px150 and px160? Again, much appreciation for all previous and future reponses! The casio keyboard is weighted in such a way as to mimic the resistance found in the keys of an acoustic grand piano caused by moving the weight/inertia of the hammers. Furthermore, that weighting is graded, just like on an acoustic grand (the weight at the lower end of the register is slightly greater simulating the slightly heavier hammers on the low end of an acoustic piano). The key tops are made with a simulated ivory material (I've never actually played a piano with actual ivory keys so I can't comment on the authenticity of that). The sound engine also emulates the sympathetic resonance of other strings when the dampers are lifted. In short though, there has been a lot of work put into simulating the feeling of playing an actual acoustic grand piano. Though, some aspects are lacking. For example, the privia pianos have no simulation for the let off (the point where the hammer on an acoustic piano disengages from the jack). Digital pianos which incorporate that sort of subtle feeling cost 2 to 3 times as much though, and even some high end digital pianos lack it. The point is that it's not going to be a perfect simulation of an acoustic piano, but it is a very good one for the money you are spending. Is it good enough for your needs? The only way you can know that is to play one. P.S. 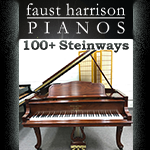 I forgot to answer your question about the piano differences between the 150 and 160 models. The two boards share the same keyboard action and piano sounds. The 160 has somewhat better onboard speakers, and some of the other sounds (electric pianos and strings) have been improved. Another enhancement is dedicated line outs (to connect to speakers or a keyboard Amp). P.P.S. You can get a very improved piano sound from your digital piano by using a computer in conjunction with sound libraries. Those extra sounds can be expensive, but it is a way of improving your investment as time goes on. How well does the key action mimic a grand piano? 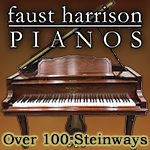 No digital piano has an action that mimics that of an acoustic piano. Exceptions: the Avant Grands (and similar), which have a proper grand action inside ... for $7k to $15k. The marketing blather seems to claim that digitals "mimic" a grand. But they don't. So get your hopes up. From this I gather that it you know what how a proper piano behaves. Just don't expect that from a digital. You'll have to sacrifice a bit. 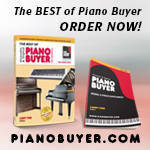 To find an answer to your question ... visit some piano stores and try a bunch of pianos for yourself. None will match the Yamaha grand, but perhaps you'll find one that's good enough. A digital piano is a kind of instrument, and regardless of what some people here imply, a lot of them are just fine. My Kawai ES7 doesn't feel the same as my Kawai parlor grand, but the ES7 is a very playable and musical instrument for classical and popular music. I have no trouble whatsoever going back and forth between the two. I've played both with my chamber ensemble, and I've played many worse real pianos than the ES7. Before I got the grand, a friend tried to sell me his Baldwin grand... I tried it, but it was considerably worse to play on than the Kawai ES7, and I didn't want to bring a piano into the house that didn't really sing. It sounds like you can't get a real grand. So a get digital that you like. I have actually had decent luck buying used, but I tend to go through craigslist rather than eBay. That way I can actually get my hands on the instrument before deciding. Try every note at several volume levels to make sure there aren't any surprises. Try all of the features you plan to use at home (internal speakers, headphone jacks, a variety of its different voices). You can also see if a local music shop has any used instruments. That gives you the plus of being able to compare the older cheaper instrument with more current offerings. Thanks again for all the help. I decided to take the advice on trying out the casio px150 in person, and I really love it! Now I just have to decide between the 150 and 160. Glad you found it suitable for your needs! I would suggest that the PX-160 is a better way to go if you can wait for its release (not sure where you live but in the states it should be available in a couple of weeks, though demand might be high, pre-ordering could be a good idea if you decide to go that way). I think the main reason I'd go with the PX-160 is resale value. Imagine that in 3 or 4 years you decide to upgrade to something better and you want to sell it. The PX-150 will be at least one (possibly two if another model comes out between now and then) generations behind. I think you'd find it much easier to resell the PX-160 at that point than the PX-150. Also, if you ever have a need to hook your digital piano to external amplification (maybe you want to add a subwoofer for better bass, or maybe you want to take it to a party or a gig where you need more volume, etc..) the PX-160 has dedicated stereo line outs for that sort of connection (whereas the PX-150 requires you to use the headphone jack for that, a less than ideal solution). You may have no desire to hook your keyboard up to external speakers today, but who knows what you will want 2 years from now. With the PX-160 you're set up to do that easily if it ever becomes an issue. Also, the PX-160 does have even better speakers and some better sounds (Strings and electric pianos). If you decide to go with the PX-150 (it's available now, after all), I would say that you should be able to argue for a good discount on it since the PX-160's release is imminent.